​​​​​View Public Angler Access Map in full screen. Physical/ Habitat Description - At 50 acres in size, Wye Mills Lake is among the largest impoundments on the Eastern Shore. Maximum depth is 8 ft, and the average is 4 ft. The upper third of the lake is quite shallow with gradual drop-offs, while the lower two thirds of the lake has steeper banks with sharp drop-offs. The lower two thirds of Wye Mills Lake consists of outstanding fish habitat. There are many downed trees and undercut roots on the shorelines. Aquatic vegetation is widespread during the summer months. Additionally, several fish attractors have been placed along the concrete dam breast to provide fishing opportunities from shore. 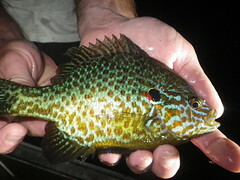 Fish Species - Wye Mills Lake is a standard bass/bluegill lake and is managed as such. Good numbers and sizes of bass and bluegills are present. Bass have abundant forage from which to feed and can be finicky as a result. Fishermen stand a good chance, however, to catch a trophy from this lake. Anglers may also catch other species including: white and black crappie, pumpkinseed sunfish, brown bullhead catfish, common carp, yellow perch, gizzard shad and golden shiners. Restrictions - There are no horsepower limitations for the lake, however the maximum speed limit is 6 knots. Electric trolling motors are preferred. Swimming and camping are not permitted. History - Wye Mills Lake was formed in colonial times for the purpose of holding water and diverting its flow in order to provide a means of power for a grain mill. Today an operational reconstruction of the mill is present and is an attraction of historical interest. The Maryland Department of Natural Resources, Fishing and Boating Services, Freshwater Fisheries Division, owns and manages the lake to provide a public angling resource. Fiscal resources for this work and maintenance of the grounds comes from fishing license sales and the Federal Aid and Restoration Fund (Dingell-Johnson Act).